Jonesboro, Ark., June 1, 2018 – NEA Baptist announced today its first commercial use of the Medtronic Resolute Onyx™ 2.0 mm Drug-Eluting Stent (DES) – the smallest sized DES on the market, designed specifically for small vessels. The new stent is unique in that it is intended to help interventional cardiologists treat patients with coronary artery disease (CAD) who have small vessels often untreatable with larger stent technologies during percutaneous coronary intervention (PCI). It is estimated that approximately 65 percent of smaller vessels (≤ 2.25 mm) are in critical locations of the heart, making them significant lesions to treat. The first case was performed by Dr. Matt Haustein, cardiologist at NEA Baptist in March, followed shortly after by Dr. D.V. Patel, cardiologist also at NEA Baptist. The patient who underwent the first procedure, Carey Clayton, had great things to say about his experience. He stated, “The care is excellent here – from Dr. Haustein to the nurses and all of the staff. They are just exceptional! 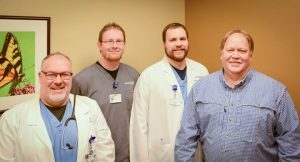 Dr. Haustein even talked to me during the procedure.” Clayton was identified as a candidate for the new stent technology when he had an appointment with Haustein due to an excessive amount of chest pain and shortness of breath. Clayton is the proud grandfather to two grandchildren who were both born at NEA Baptist. The first-and-only 2.0 mm DES size available in the U.S., the newly approved stent joins the unique Resolute Onyx 4.5- and 5.0-mm DES to provide physicians with the broadest DES size matrix available, expanding treatment options for patients with the smallest coronary vessels to the largest, from the simplest of anatomies to the most complex. In addition, the stent is engineered with the lowest crossing profile of any DES (less than 1 mm) enabling exceptional deliverability. Once delivered, the Resolute Onyx 2.0 mm DES is engineered to expand from 2.0 mm to the maximum labeled expansion diameter of 3.25 mm.